if you have a friend, family member, or significant other that really likes beer ..this DIY is for you. one random tuesday morning at 9AM, my fiance calls me, asking begging me to go to the liquor store. at 9AM on a tuesday. apparently this beer, called hopslam, brewed by bell’s is only released once a year and it goes fast. so I changed out of my pajamas and off I went, feeling ridiculous & passing judgement on myself. all in the name of love I kept repeating. 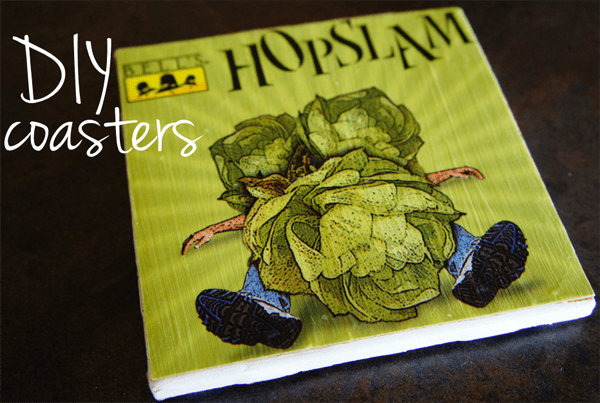 then to further show my love, I turned his beloved hopslam six-packs into coasters that he can keep forever. all you need is: glue, mod podge, a paint brush, a plain white tile [you can get these at any hardware store], and a 6-pack carrier. cut the beer logo out and trim to size of tile. add a layer of mod podge to the tile. dot glue around the edge of beer logo. center & let dry. paint on multiple layers of mod podge. [be sure to get around the edges]. let dry. and ..
[secure felt circles to the tile’s corners – you can get these at the hardware store too]. these DIY coasters make for a very personalized, thoughtful gift. sure to be a hit. perhaps for valentines day ..